Very few Australian census records survive, making electoral rolls one of the most important resources available for tracing relatives down under. Much like censuses, electoral rolls will help you keep track of your family over time and reveal information like names, birth years, occupations and addresses. 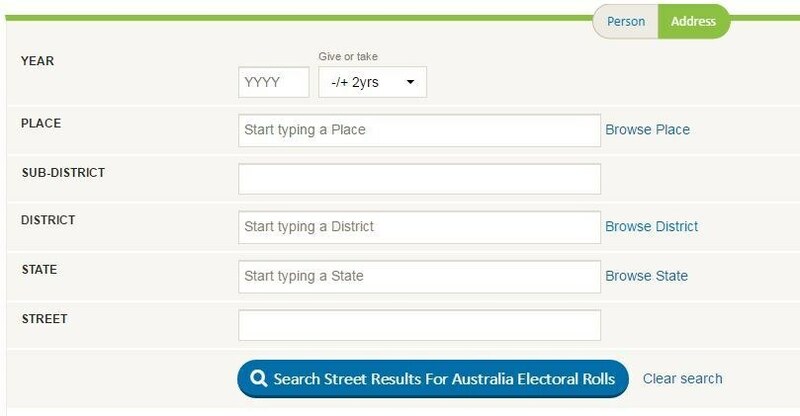 Findmypast's Australian Electoral Rolls are all included in one central collection and they are all fully transcribed. This makes searching for your Australian ancestors easier than ever before. You can search for all your Australian ancestors, no matter what state they resided in, from the same record set, saving you time and energy. With the most important information from the original records transcribed, your search results will be more accurate and you should find who you are looking for a lot easier. As the records were transcribed from OCR (optical character recognition) documents, inevitably there will be errors, however we encourage you to report these using our error reporting tool which is located at the end of the transcription page. The search page offers the ability to perform a search using a whole range of criteria including first and last names, birth year, electoral roll year, occupation and location. Plus, you can search for other household members. In essence, this means searching for two people at once and is extremely useful when your ancestor has a common name or if you're having trouble locating them where you think they should be. You can also search solely for an address by switching from the Person tab to the Address tab at the top of the search page. This feature is particularly valuable for social historians who are researching house history. Address search allows you to enter criteria like year, street, place, district and state. Whether you're just getting started on the Australian branch of your family history research or have been doing it for years, our Australia Electoral Rolls collection is designed to make your searches that little bit easier.